The warmly welcomed Danish art of hygge is sweeping the country. Think cosy country walks, collecting logs from the wood pile in toasty clothes, connecting mind, body and soul with simple home comforts and spending time with family and friends round the fire in the dark depths of winter. Life before wood burning stoves and open fires is but a dim memory for many and, for those that do look to the fireplace at the first signs of Autumn, the tingle of all that hygge to come fires us up to prepare and make ready. Are there plenty of logs chopped or on order and are chimneys well-swept? Is log storage adequate and easy to manage? Most importantly, they may look good but are fireplaces 100% safe for youngsters – toddlers and pets – or others who may be unsteady on their feet? To help solve the latter and generously contribute to the former, finding a sturdy, well-made fireguard is an important and timely decision at time of writing so we’ll help here to explore a couple of options. Safety first. Strength and sturdiness are key in this important quest for the best. Choose British and hand-made in materials that will last lifetimes. Our guards are made by John and team in our metalwork workshop near Bath – from zinc-galvanised steel – super strong structures with solid steel ball feet for stability. Optional spark liners for randomly spitting logs can also be secured. Looking good. Garden Requisites fireguards are just as at home in modern interiors as they are in period schemes. There are two types to choose from – Traditional and Contemporary. The Traditional design works really well in Georgian, Victorian and Edwardian properties and is modelled on dependable Victorian nursery fireguards with signature English wirework incorporated. 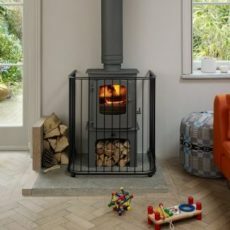 New in 2015, a more modern rod design, the rather stylish Contemporary fireguard fits more minimal environments and just as much care has been taken in considering safety. The rods are just 2”/5cm apart – nice and narrow for the opportunist cat’s whiskers. Harking back to hygge around the hearth, Autumn and Winter family gatherings and holidays are happily on the horizon. Mantelpieces will be made magical with seasonal decorations and festive recipe books raided. Whose houses will be the centre of attention for this year’s homely celebrations? Will your pets travel away with you or others’ come to visit with extended family and friends? Will calm reign in freshly toddler-proofed kitchens and living rooms? What better practical present for new pet owners/parents and grandparents than a handcrafted heirloom fireguard? Freshly forging customer orders means that it’s no problem at all for us to fashion a fireguard that’s a ‘funny shape’. 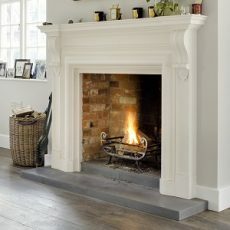 This works particularly well for log burning stoves that jut out or stand clear of fireplaces. Wrap round guards are possible! Just measure up and give Hilary and team to speak about solutions. In the meantime, get the kettle on, grab a notebook and move on over to Pinterest for some seriously inspirational log fire looks. PS – we make some lovely log holders too.